Jointly with the building of the tramway, Tramway Alliance will also rebuild all pavements, underground municipal engineering (cabling and pipes) and streetlights along Hämeenkatu to comply with the street plan. On 4 February, the City of Tampere made the decision to extend the contents of the Tramway Alliance construction project to cover the rebuilding of Hämeenkatu. According to the contract, the section of the tramway running along Hämeenkatu will be completed in 2021, and the construction of the pavements will be completed in 2022. 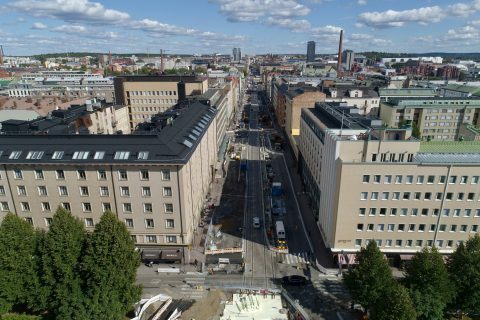 Hämeenkatu will be rebuilt to comply with the street plan, taking advantage of the traffic arrangements and excavations necessary for the construction of the tramway. The work order along Hämeenkatu will be implemented so that the tramway is constructed first, followed by the sections of the street surrounding it. – We have estimated that the street construction work would be sensible to undertake at the same as the building of the tramway. Either way, Hämeenkatu would require rebuilding at a later time, but in this way, the total duration of the construction is shorter and the inconvenience to traffic and the surrounding areas is minimised. We also wish to ensure that the construction project achieves the best possible technical functionality, and that quality risks at different phases in the project and resulting from the collaboration of various different operators are minimised, says the City Of Tampere Head of Construction Milko Tietäväinen. Work on the pavements along Hämeenkatu will be implemented in the same way for each section of the street. First, the foundation of the pavements is replaced, meaning that the paving is removed, soil masses are replaced as required, a foundation is laid for the electric railway and lighting poles and soil beds for new trees are added. After this, electricity and lighting poles are installed, trees are planted and the pavements are repaved. If necessary, the water, stormwater and cable networks for properties along the street may also be replaced. At the same time, work on the tramway will take place in the mid-section of the street. – For the construction of the tramway, the first step is similarly to remove all municipal engineering, i.e. all cabling and pipes out of the way of the tracks. At the same time, all pipes will be replaced, extending their serviceable age by decades. The majority of this work has already been completed along Hämeenkatu, and the construction of the tramway has already progressed further than was originally scheduled, Tramway Alliance’s Project Manager Mikko Nyhä says. We will continue working in the mid-section of the street alongside the construction of the pavements. In Tuulensuu, paving work is under way and this section of Hämeenkatu is scheduled for completion in June. The block between Näsilinnankatu and Kuninkaankatu at the western end of Hämeenkatu is also scheduled for completion this year, and the objective is to also complete work for the north-side section of the street between Kuninkaankatu and Aleksis Kiven katu. In this section, work will also commence on the southern side of Hämeenkatu. At the eastern end of Hämeenkatu, the objective is to complete the section between Aleksanterinkatu and Rautatienkatu, excepting the area of the building site located on the southern side of Hämeenkatu. The reconstruction of the pavements causes changes in pedestrian access routes along Hämeenkatu. – We are aware that the construction work is inconvenient for both residents and businesses in the area. This is why we are focusing on making traffic along Hämeenkatu as smooth as possible during construction. Here is no need to hesitate about heading out to the city centre, as access to all properties and businesses as well as maintenance access will be ensured during construction. We are also focusing on our communications to businesses and properties in the area, Milko Tietäväinen emphasises. During construction, bus traffic arrangements along Hämeenkatu will remain as they are. In 2019, bus traffic will run from Tuulensuu towards Keskustori and both ways at the eastern end of Hämeenkatu. Pedestrian crossings and bus stops may need to be relocated during construction. The construction of part 1 of the Tampere tramway (city centre–Hervanta–Tampere University Hospital) continues to progress according to plan. Over half (54%) of the project has already been completed. – We are progressing entirely on schedule. The newly commenced period is equally busy as last year was, and approximately eight more kilometres of track will be laid for the tramway during the current period. The majority of this will constitute the ballast track section of the tracks laid down along the Hervannan valtaväylä this summer, Mikko Nyhä says. – Additionally, approximately two kilometres of track will be laid down at the depot. The large tramway bridges constructed along Hervannan valtaväylä will also be completed this year, and construction for the tramway and tram stops will continue in the city centre, Kaleva and Hervanta. New green environments are planned along the tramway line. Along Sammonkatu in Kaleva, over 200 new trees will be planted over the coming spring and autumn. Additionally, lawn will be planted on the tracks running along Sammonkatu and Teiskontie in late autumn. 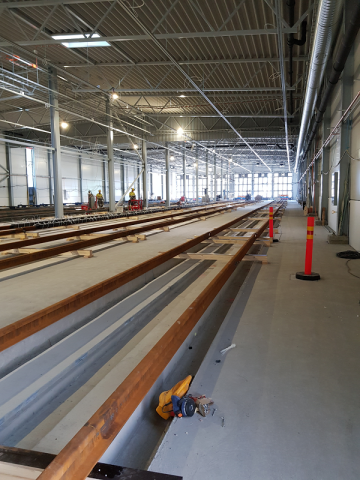 At the depot, floors have been cast, building technology installed, partitioning walls constructed and large folding doors and windows installed over the past winter. Over the spring, track installation in the depot hall will be completed, after which surface structure work will commence in the depot’s yard area and in the repairs hall. The depot will have a total of approximately three and a half kilometres of track, nearly half of which will be installed indoors. This year, work continues on systems relating to power feeders, the safety devices for rail switches, traffics lights and other lighting for the streets and the overhead contact lines for the tramway. All electricity supply stations for the tramway are under construction and will be completed over the summer. Overhead contact lines for the tramway have already been installed in Hervanta and along Hervannan valtaväylä. Over the spring, work will continue with the installation of wall fixtures in the city centre, and in the autumn, the installation of overhead contact lines will continue in Kaleva. The planning of the western extension of the Tampere tramway from the city centre towards Lentävänniemi is under way. On 5 March 2019, the Tampere Community Board approved the street plan for Federleynkatu, Niemenrannanaukio and Kehyskatu located in Niemenranta. The board also approved the plans for Sepänkatu, Paasikivenkatu and Rantatie adjacent to the city centre. Tramway Alliance continues to plan the western section of the tramway. The objective is for the Tampere City Council to make its decision on the construction of part 2 of the tramway by the autumn 2020 at the latest. A water and sewage line is being installed along Pirkankatu between Pyynikintori and Sepänkatu. The installation of materials continues at the Pirkankatu electricity supply station. The running of cables beneath Pirkankatu will commence at the crossing for Pirkankatu and Mariankatu, after which surface structure work including the installation of slab tracks will commence at the junction. This work will result in some changes in car and bus traffic, and the pedestrian crossing across Mariankatu will be temporarily out of use in June. Pirkankatu will have two-way traffic during the construction work. Any changes to cycling and pedestrian routes in the area will be signposted. The majority of the surface structure work long Pirkankatu will be completed this year. Wall fixtures for the overhead contact lines will be installed over the spring. In Hämeenpuisto, the installation of slab tracks will commence in front of library Metso, and there will be some changes to traffic arrangements over the spring. Additionally, paving work for the slab tracks will continue in Hämeenpuisto. Work in the park area will be carried out in several phases and will not be fully completed until 2020. The work will cause some changes to pedestrian and cycling routes and vehicle traffic in the Hämeenpuisto and Pirkankatu areas, as pavements and street areas are turned into construction sites. At the western end of Hämeenkatu between Hämeenpuisto and Näsilinnankatu (i.e. 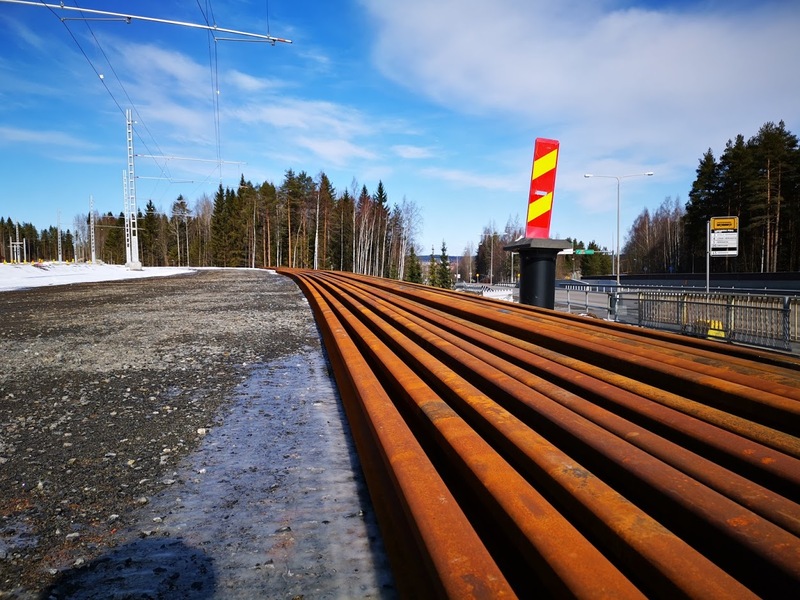 in Tuulensuu), the installation of pavers will continue for a few dozen metres from mid-April, after which everything but the electrical installations for the tramway will be completed in the Tuulensuu block. Tuulensuu is scheduled for completion in June, and it will act as an example of what the new Hämeenkatu will look like once completed. Between Näsilinnankatu and Kuninkaankatu, foundation work for pavements continues, meaning that soil masses are replaced, a foundation is laid for the electric railway and lighting poles and soil beds for new trees are added. After this, electricity and lighting poles are installed, trees are planted and the pavements are repaved. Due to the construction, the Näsilinnankatu and Hämeenkatu junction at the northern side of the street will be closed in early June. Kerb stones will be installed along the section between Kuninkaankatu and Hallituskatu starting from June, which may impact access routes. Between Kuninkaankatu and Aleksis Kiven katu, work on pavements’ foundations and paving will similarly take place starting from the northern side of Hämeenkatu. The objective is to complete work on the northern side this year and to move on to the southern side in front of Sokos this autumn. Between Keskustori and Hämeensilta, work on the tramway’s surface structures, i.e. the installation of the slab tracks will take place as close to Hämeensilta as possible. The work will affect bus routes and the bus stops at Keskustori may need to be relocated. Pedestrian access routes may also change. Starting from April, tramway construction will take place in the area between Hatanpään valtatie and Koskikatu, and traffic on Hatanpään valtatie will be redirected via the western side of the construction site. In May, work on surface structures and rail switches will commence in the junction area. Surface structure work in the section between Koskikatu and Pellavatehtaankatu will commence in June-July in the mid-section of Hämeenkatu. Work in the section between Pellavatehtaankatu and Rautatienkatu has progressed to the pavement areas, where underground cabling and pipes are replaced, a foundation is laid for the electric railway and lighting poles and soil beds for new trees are added. Additionally, poles are installed, new trees are planted and the pavements are repaved. At the junction of Rautatienkatu and Hämeenkatu, work on the tramway continues in May. Traffic arrangements between Hämeenkatu and Itsenäisyydenkatu are already as planned for after the completion of the tramway. There will be occasional changes to pedestrian access and crossings due to the tramway construction. The tramway’s surface structure work on Itsenäisyydenkatu is progressing from the railway tunnel towards the Tammelan puistokatu junction. Due to the construction work, the pedestrian route starting from the eastern end of the Railway Station tunnel will be partially closed. The route will remain in use, but it will feature a set of stairs and will no longer be accessible. Due to this, there will be an accessible bypass route between the Railway Station and Itsenäisyydenkatu during the construction work. Work on the tramway at the eastern end of Itsenäisyydenkatu will be completed over the summer. Wall fixtures for the overhead contact lines will be installed during late spring. 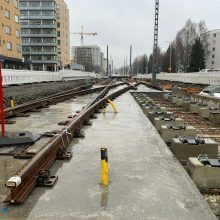 Rail switch tracks and slab tracks will be installed in Sammonaukio from mid-April. This will not impact traffic arrangements. Tram stop pavers and railings are installed on Sammonkatu. Lawn will be planted on the tracks running along Sammonkatu in the autumn. Foundation work and the installation of slab tracks will commence on Rieväkatu after Easter. Due to this, a bypass and temporary traffic arrangements will be in place in the Rieväkatu and Sarvijaakontie junction. Work on the electricity supply station will also continue on Rieväkatu. Foundation and surface structure work continue on Teiskontie. Due to this, temporary traffic arrangements will be in place in the Ilmarinkatu junction, as the tramway’s construction site will be located in the middle of the junction area. As a result, lanes in the junction will be narrowed and some lanes will be one-way in the junction area, affecting traffic routes. During the construction work, there will be no access onto Uimalankatu from Ilmarinkatu. The southern side of Teiskontie will only have one lane, as surface structure work takes place in the mid-section of the street. The Kaupinkatu junction will need to be temporarily closed in early June. Bus stops will remain in their current locations. Work on the tramway electricity supply station continues on Tekunkatu. Work on a protective casing for a gas pipe and, after that, on the foundation work for ballast tracks and a tram stop will take place on Vieritie. Over the summer, ballast tracks will be installed and the tram stop paved. Work on the Tays tram stop will start in early summer so that the paving and surfacing work for the stop will be completed by early July. New traffic lights will be installed and surface structure will commence for Hervannan valtaväylä in April-May. Along Hervannan valtaväylä, the tramway is implemented using ballast tracks. Surface structure work will also take place on the tramway bridges. Overhead contact lines have been installed along Hervannan valtaväylä throughout the spring. New traffic lights will be installed for trams on Insinöörinkatu in the autumn. Additionally, the tramway’s surface structure including track and slab track installations will be completed this year in the sections between Opiskelijankatu-Lindforsinkatu and Atomipolku-Arkkitehdinkatu at the northern and southern ends of Insinöörinkatu. Due to the work, Insinöörinkatu will be closed off for traffic in sections. Access to properties will be ensured during work. Pedestrians and cyclists will be redirected to bypass routes if necessary. In Tohtorinpuisto, work on the tramway’s foundations continues and the construction of a new underpass will commence. The section of the tramway running through Tohtorinpuisto and the new pedestrian and cycling paths will be completed in late autumn. Construction of an electricity supply station will commence in early May. Earthwork related to the construction of the tramway continues in the Makkarajärvenkatu area. The installation of building technology and partitioning walls is under way at the new depot. The installation of tracks is progressing inside the storage hall, and after its completion, work on surface structures continues in the depot’s repairs hall and in the yard area, where other construction work will also take place. The depot and its yard area will be completed in 2020, ready for test traffic.